M64 is a bright spiral galaxy and is a member of a small group of galaxies which includes the Starburst Galaxy, M94. 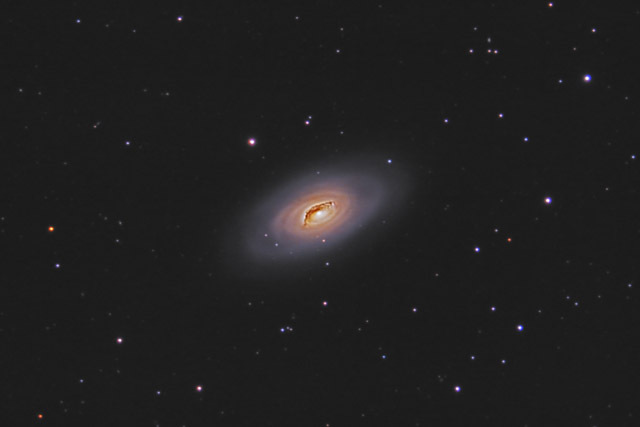 M64 has a prominent dust lane which gives the galaxy its nickname of "The Black Eye Galaxy". The nucleus of the galaxy is modestly active, and it resembles the nucleus of a Seyfert galaxy. Remarkably, the galaxy consists of two distinct regions which rotate in opposite directions. The inner part of the galaxy consists of gas and stars and is counterrotating to the gaseous ring in the outer section of the galaxy. Astronomers theorize that M64 has recently collided with another galaxy, and this is what generated the counterrotating regions. In this image, North is Up. This image is cropped to 43% of the original full frame. Software Used Images Plus 4.5 for camera control, calibration, stacking, digital development, deconvolution, multiresolution sharpening, smoothing and noise reduction. Photoshop CS5 used for levels and curves, color correction, high pass filter, star shrinking, saturation adjustments, and screen mask invert. Gradient Xterminator for gradient removal. Carboni Tools for additional saturation adjustments, noise reduction, and smoothing. HLVG for additional color correction. Notes On the first two nights I photographed this object, I had a bit of problems with the guiding. By the third night, I had corrected the guiding problems and was able to obtain some excellent data. While processing this image, I masked the details in the dust lane so that most of the these details come from the excellent conditions of night 3. I am quite happy that the resultant image sports some good quality details. This image was published by Astronomy Magazine as its Picture of the Day for May 23, 2017!